Forecast: A Dime for Me moves to the Morey barn, and after hitting the board in three of her first four starts looks ready to finally break through with a maiden win in a below par race for the level. Meritocracy move up from maiden $20,000 to this maiden $50,000 affair but is a solid fit on speed figures and is a “must use” in rolling exotic play. We’ll try to get by using just these two. Forecast: Pee Wee Reese has been away since last summer but returns to his favorite course – he’s won four of five over the local lawn – and the D’Amato barn has solid stats with layoff runners, so we’ll assume the son of Tribal Rule is fit and ready. Drawn comfortably outside, he should settle into a cozy pace-stalking position and then have every chance. Eddie Haskell just edged world class turf sprinter Stormy Liberal under these conditions in an overnight affair in late February and won’t need much more than that to score right back. Forecast: ​Lovely Raquel drops to her lowest level ever, is reunited with “win rider” Delgadillo, and seems as good as any in this restricted (nw-2) $12,500 sprint for older fillies and mares. She’s a one-paced grinder but in this league seems capable of producing the last run. Heloise has steadily rising numbers and is another that should be doing her best work late. These are the two we’ll sink or swim with but not with a high degree of confidence. Forecast: Conquest Tsunami is 4/5 on the morning line in the San Simeon S.-G3 following a runaway victory over this course and distance in the Clocker’s Corner Stakes in his most recent outing last month. Nothing more will be needed for a repeat win, especially given the project pace scenario, which on paper looks relatively soft. We’ll make him a no-value rolling exotic single in a race that we’ll otherwise pass. Forecast: Owning looks fairly solid in this starter’s optional claimer for 3-year-olds after missing by a neck in a similar affair last month while earning a career top number. The Carava-trained gelding should be in the fray throughout while probably having to deal with recent runaway maiden-claiming winner Wild Bean and class dropper Diamond Blitz on the front end. The former didn’t have much behind him when graduating by more than six lengths in just his second career start, but he did it the right way and will be dangerous with another forward move. ‘Blitz turns back to a sprint won’t have to deal with Roadster and Nolo Contesto today. His dirt sprint form is suspect but at 8-1 on the morning line he’s worth throwing in. 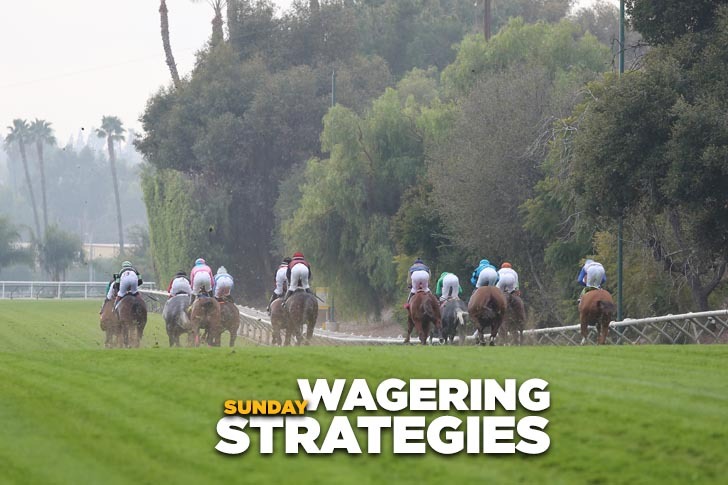 Forecast: ​Blitzkrieg has turned into a monster of late, winning back-to-back Hillside turf sprints, most recently by more than six lengths with a career top speed figure while displaying a massive turn of foot from the furlong pole to the wire. He moves from starters company to a first-level allowance event today but given his recent form the son of War Front should handle the class hike in stride. Mr. Twinery is a consistent turf sprinter from the Bay Area that might be able to make some noise on this circuit. He should be on or near the lead at until the pressure is turned on at the head of the lane and may be able to stick around for at least a piece of it. The main punch goes to Blitzkrieg, but we’ll have a ticket or two using Mr. Twinery as a saver. Forecast: Big Barrel earned a speed figure two races back when runner-up in a similar affair for state-bred maidens that will be good enough to beat field, so we’ll put him on top despite his lack of tactical speed. Posterize returns to dirt and shortens to a sprint, and at 5-1 on the morning line this son of Shackleford looks dangerous, assuming he leaves cleanly from the rail. Golden Birthday showed some ability when runner-up in a slowly-run affair in his debut; he has every right to produce a forward move and should be included at 6-1 on the morning line. Forecast: S Y Sky is perfect in two starts down the Hillside course and looks capable of returning to winning form, though chief rival Queen Bee to You, who was a close second to ‘Sky under similar conditions in the Sunshine Million Filly & Mare Turf Sprint in January, should be formidable once again. S Y Sky has been beaten no less than five times as the favorite in her 10-race career, so she’s not one to trust, but we’re expecting her to fire her best shot today. You also might want to toss in Algorhythmic, a five-time winner down the hill and making her first start since being transferred to the Brinkerhoff barn. She’s been facing some tough customers lately and could take the field a long way on the front end at a price.